The iPhone has a pretty powerful camera for a smartphone, and the iOS Camera app works well for most people. But if you’re a serious photographer and want more camera controls, you need to use a third-party camera app. Here are four camera apps that give photographers as much control as possible. In this round-up, we examine the more mature Camera+, Manual, and ProCamera, plus a new entry, Halide, that stacks up well alongside them. Camera+ lets you expose features from under the hood selectively. One of the grandaddies of camera apps, Camera+ ($3 on the App Store) offers editing—including for RAW images—within the app via its own “lightbox,” which gives you the option of storing photos you take without automatically saving to the Camera Roll. The app exposes manual controls through a neat set of interlocked options: focus, shutter speed, and white balance. Focus is shown initially as a purple box with a plus sign in its upper right. Dragging an exposure bar left and right at the bottom modifies those settings. However, tap the plus sign, and a orange circle labeled Exposure appears, and both boxes gain a lock icon in their upper right. Exposure combines shutter speed and white balance, but you can break them out. Tap either the shutter or WB icons at the bottom of the camera view and dragging either. Changing the shutter speed switches to shutter priority, favoring that above the other parameters. In advanced settings, you can swap between shutter priority and “full manual.” You can also use settings to switch between color presets, like daylight, and a color temperature slider. You can adjust focus manually by tapping its icon at the view’s bottom, and then dragging back and forth. However, the lack of a visual indicator—as in Manual and Halide below—to help know when an object or scene is in focus makes it hard in my experience to use manual focus in bright light. Tapping a lock icon in the camera for either focus or exposure locks in the current settings and overrides automatic changes, and also drops a lock icon into the center of the affected controls at the view’s bottom. The app lets you save a RAW file for every shot with a single lens either as a combination JPEG or TIFF and RAW file or as separate files. Camera+ relies on in-app explanations of controls. I was unable to find any help files, a manual, or even a way to send email requesting help—just feedback and bugs. 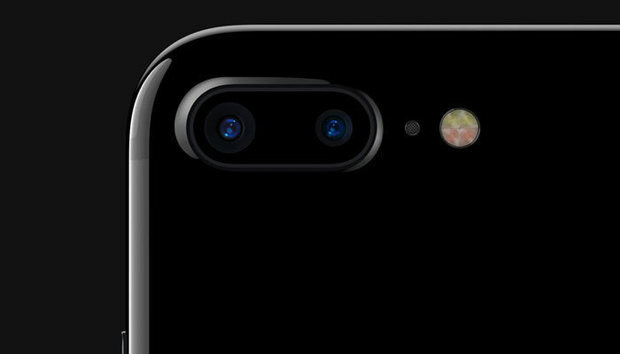 iPhone 7 Plus: A button in the upper right of the camera view shows a letter and a clever icon to indicate which camera is in use: with W (wide angle), it shows a smaller figure and the sun over their shoulder; with T (telephoto), a closer-up head and shoulders. The D (duo) mode shows a diagonal slash combo of the two. Tap the icon and you can swap among the modes. By choosing W or T, you can still use digital zoom (up to 6x). In the blended view, which alerts you that RAW shooting is disabled, the zoom offers both a visual marker at 2x and haptic feedback at 1x, 2x, and 12x. Takeaway: Camera+ offers good controls, but it’s best suited for a photographer who wants to use its combination of capture and editing options rather than one looking for the best manual-setting app. Halide ($5 on the App Store) tries to put all features on the main screen, making them fully discoverable and intuitive. It doesn’t entirely succeed, and a four page “manual” isn’t enough to reveal everything. Nonetheless, it’s a lot of power available through a few sliders and taps. In its default setup at launch, the only thing you control is exposure by sliding a finger up or down anywhere on the camera preview. An AF (for autofocus) is lit up in yellow and just below the preview. Either tap it or drag from the left, and you engage manual focus. Halide doesn’t offer a zoomed-in view to ensure focus, but if you’re using manual focus and tap the circle at left, which has a discontinuous circle inside it, the app uses a remarkable and vivid focus hint: everything in focus is traced in bright red. Algorithms determine whether something is in focus by finding adjacent pixels with somewhat different tonal values and adjusting focus back and forth until the highest contrast gets reached. Here, Halide essentially reveals what the algorithm has figured out is the plane of focus in the field of view. It’s unique and incredibly handy, especially in bright light. But there’s more beneath the hood. Tap an upward pointing triangle at the top of the screen, and it changes to an M and reveals ISO and AWB buttons that, when tapped, let you set virtual film speed through a slide that appears at the bottom of the preview for ISO and white balance scenes from a set of icons at the top. In another nice touch, tap a histogram icon at the upper left, and the current tonal distribution appears overlaid in the lower left. To enable and disable saving a RAW format file, swipe down from the tap and then you can tap the RAW button to toggle states. Unlike the other app reviews, RAW mode only saves RAW format files—it doesn’t generate a JPEG or a combined JPEG/RAW file. One neatly discoverable element is a level helper. When the camera is held below about 30 degrees or less in any direction away in relation to the floor or ground, two bubbles appear: one at the center indicating level and the other showing how far off you air. You can move the camera around and the two rings overlap and turn into a yellow outline when you’re exactly level. I see why people were so quickly taken by Halide. It lacks all the bells and whistles of Camera+ and ProCamera, but offers all the essentials entirely in the main interface. iPhone 7 Plus: Halide avoids digital zoom and the dual-camera synthesized image. You can tap a 1x/2x button at the bottom of the camera preview to swap between cameras. Takeaway: Halide’s unique focus helper combined with putting all its controls on the surface. It needs more in-app or online help or documentation to make best use of the app. Manual’s zoom-to-focus area is a big help in bright lighting. One of the first apps to take full advantage of third-party access to iOS camera features, Manual ($4 on the App Store) has stayed true to its early aesthetic and approach. The app’s design breaks out manual features into different parts of the preview and interface. Manual opts to show virtual ISO and shutter speed at all times, but you can toggle between setting them independently or switching to automatic, where an in-preview slider lets you adjust exposure value (EV) up or down. Using the EV slider locks the relative exposure even as the Manual app adjusts ISO and shutter speed to keep the exposure constant relative to the current scene you’re framing. The manual ISO and shutter-speed controls are a little awkward to move more than a few steps through. It requires a tap and hold to drag, and you can’t necessarily move your way through all the possible settings without releasing and tapping and holding again. Focus is just below the camera preview, and you can drag left or right on the focus slider to lock it in. Manual uses a DSLR-like zoomed-in area as you change focus, letting you more clearly see how dialed in you are. I find this approach most useful, though Halide’s “red outline” focus is a great alternative. Tap AF to return to autofocus. Manual has an interface issue with some selections. The White Balance (WB) appears at the top, and tapping it lets you choose between automatic and various scenes. You can also pick K and slide to a specific color temperature. Manual’s settings let you save a RAW and JPEG image with each capture, but they can only be saved as separate files. The developer should consider offering a combined format as an option. iPhone 7 Plus: Manual offers a button at the top labeled 1x/2x that you can tap to toggle between cameras, and shows the lens focal length briefly on screen when you swap. The dual-camera synthesized image isn’t available, nor is digital zoom. Takeaway: Manual’s focus enlargement is the best I’ve tested, but it needs minor interface improvements to be as easy to use as Halide. ProCamera has a more detail-cluttered display than similar apps, but it’s powerful and offers a lot of control. ProCamera ($5 on the App Store) is a little hard to review, because it’s such a huge collection of various photographic options and add-ons, and comes with a detailed manual to match that. At its heart, with a pedigree of development as long as Camera+’s, it provides powerful manual control options. It also has in-app editing tools, including for RAW images. You can opt which controls show up and in what combination they appear from the menu at lower right, below the camera preview. Tap the hamburger button, and a panoply of options appear. For the purposes of this look, I’ll look at F/E Lock, ISO & Shutter (which has two modes), white balance, histogram, and format. The ISO & Shutter feature toggles through three states, all of which are controlled through the top of the camera preview: automatic (white, unselected button in the menu), which shows the exposure value; Manual Mode (green, shows M), which offers separately set shutter speed and ISO selection; and Shutter & ISO Priority Mode (green, shows SI), which lets you dial in either shutter speed or ISO, and ProCamera picks the appropriate corresponding value for the other setting. These exposure and speed options appear at the top of the preview, and you can tap any of them to select, and then use a slider at the preview’s bottom to adjust the setting. ProCamera offers everything and the kitchen sink, but you can selectively enable options you need. The F/E (focus/exposure) lock lets you separately control focus (via a blue rectangle) and exposure (through a yellow circle), which you can drag around to points in the preview. Hold down and they’re locked in place. Oddly, for such a mature program, manual focus has only recently been added and it’s listed as a beta feature in settings that has to be enabled. It can be set so that it’s only available when focus isn’t locked. You can then slide a finger up and down for coarse focus adjustment and, without lifting your finger, slide left and right for fine adjustment. Unfortunately, you can only see focus across the entire preview, with no enlargement or other helper beyond your eyes. White balance can either be automatic (as AWB) or, when that button is tapped, set by a color temperature slider along the bottom. The white-balance slider has icons next to preset scene temperatures, and lets you adjust both or either by tint and temperature. However, it takes up too much onscreen space when in manual mode, covering a portion of the bottom of the preview after being invoked. It can’t be hidden. The menu area also lets you choose among methods to save a photo by tapping the Format button, which rotates through JPG, TIF, RAW, and a combined RAW/JPG. iPhone 7 Plus: ProCamera offers lets you switch between cameras through a 1x/2x button at the bottom of the camera preview, or via the menu, which offers Wide and Tele buttons at the bottom. There’s no digital zoom in those options. However, it also offers a Dual mode that allows for the full 1x to 12x range of optical and digital zoom. Takeaway: ProCamera exposes more camera details than some users may need or like, and it’s a bit overwhelming with features if all you want is quick access to manual controls. However, its richness helps reward study with its documentation and tutorials. It still needs to nail down and improve manual focus. An app that puts control into a photographer’s hands could let you tag objects that remain in focus even as the scene moves, or even simulate different settings for different planes of depth by capturing multiple images and synthesizing them together—a kind of “in-camera” multiple-exposure trick that goes far beyond HDR. With more computational options available to developers, we should see more variation about what “manual control” means this fall.